While the two films of the Fifth Generation promise to reconstruct bygone times and lost civilizations with collective emblems and rituals, the two later films rework the same songs and symbolic artefacts of the past into individual, personal “memoirs” with humour, irony and retrospection. Even though decades and years are ostentatiously given in the inter-titles of To Live and Farewell My Concubine, a similar observation may be extended to the use of details in the two most well-known historical epics from the Fifth Generation. Compared to To Live, Farewell My Concubine is much more self-conscious and philosophical about its treatment of historical time. In the opening of the film, Duan Xiaolou (Fengyi Zhang) and Cheng Dieyi (Leslie Cheung) walk into an empty theatre with full costume and make-up as King Chu and his Concubine, the costume and make-up that have helped conceal the passage of time through the decades and have come to stand for timelessness. The conversation that ensues, however, is about time, about the number of years they have not seen each other, that is, their private, subjective time. It is not until the end of the film, when we return to the opening, that we find out the historical time of this scene: 1977. The film can be read – or deliberately poses itself – as a revolt of private temporalities against historical time. For instance, Eunich Zhang (Di Tong) asks the child Cheng Dieyi what year it was and rebutted his reply, 21st year of the Republic (1932), by claiming that it were still the Qing Dynasty. Like the Eunich Zhang, Cheng Dieyi was to insist stubbornly on his own vision of time even in the “New Society” under Communism. Flouting historical time, however, does not mean that one can be free of it. Time and again, the surviving adherents of a former dynasty, hopeless “restorative nostalgics”, are brutally shaken out of their private temporalities by the contemporary authorities. When his disciple Si’er walks out on him, for instance, Dieyi is forced to recognize that the old lessons and methods of his master can no longer be passed onto the next generation, and, when Si’er robs him of the starring role, he is forced to acknowledge the end of an old artistic standard – or, indeed, the death of the Peking Opera itself. Yet Dieyi has the capacity to subsume all historical upheavals into his own subjective vision of the eternal stage, and, more often than not, history actually consummates his performance, giving it the necessary sets, props and pathos. So the Japanese propaganda flyers in the theatre become falling flowers for Yang the Precious Consort, and the slogans and banners of different ruling regimes – the Japanese, the Nationalists, or the Communists – become merely lavish backgrounds for the tragic story of the Concubine bidding farewell to her King. In her analysis of Farewell My Concubine, Dai Jinhua laments its “dissolution of history” into an “oriental landscape”, into a “necessary ingredient” in the “Cannes Film Festival recipe of Chen Kaige’s fantasy”. (9) Yet I would like to argue that this “dissolution of history” is not only deliberate, but also executed with great deliberation. For the sake of comparison, let us take another look at the representation of the Cultural Revolution: In an era when Xiaolou and Dieyi are no longer allowed to sing Peking Opera, they have turned, instead, the denunciation scene into a performance. In this performance, they also wear make-up and costume, albeit in an unkempt and ridiculous fashion, and the Red Guards with their red banners play the walk-on part (pao long tao) before the “stars” are shoved to the centre-stage. When Xiaolou is told to denounce Dieyi, he is at first inchoate, but then breaks into a flowing dramatic monologue with an operatic lilt in his voice. These surreal elements indicate that we are not to take the scene for its face value, but rather a testimony that reality and theatre are blended and may not be separated – indeed, the triumph of Dieyi’s theatrical interpretation of history. In “Nostalgia of the Present”, Frederic Jameson writes of two “filmic modes” in portraying the American 1950s: “the high elegance of nostalgia films, on the one hand, and the grade-B simulations of iconoclastic punk film, on the other” (12). The terms “high elegance” and “iconoclastic punk” are also valid descriptions of historical details portrayed in To Live, on the one hand, and In the Heat of the Sun, on the other. In the latter film, not just MaoSpeak, but every icon, artefact and style of the Cultural Revolution reappears in irreverent contexts or parodied forms. A simple example of this is the military decorations and Mao Badges Ma Xiaojun (Yu Xia), the protagonist, finds inside his parents’ locked drawers, placed next to condoms. Xiaojun puts on all the decorations and blows the condom into a big balloon, equating sacred symbols of honour and self-sacrifice with sexual prowess. In a similar mocking gesture, the adolescents sneak into the movie theatre where their parents, People’s Liberation Army soldiers, are watching a “poisonous” Western movie. In another hilarious travesty of the PLA uniform, Xiaojun and his comrades, flitting about in their parents’ uniforms, are shown dancing Swan Lake in imitation of a Lenin in 1918 ballet scene. The most daring iconoclastic gesture of the film, however, is to reincarnate Chairman Mao Zedong himself in a cruel hooligan with “very soft hands”. After Xiaojun almost kills a boy in a mockery of heroism, accompanied by the background music of the Internationale, the victim’s gang calls for a giant battle that involving hundreds of people. According to the voiceover, both sides asked for a famous hooligan’s support, and he brokered peace between the two parties. At the ensuing banquet at the Moscow Restaurant, this hooligan, referred to as the “little bad guy”, is lifted above the enthusiastic crowd and ushered to the centre of a big propaganda painting of Mao’s face above a crowd of Chinese ethnic minorities. Both the voice-over and the imagery point to Mao’s 1966 meetings with one million Red Guards at Tiananmen Square that launched the beginning of the Cultural Revolution, a scene that Rey Chow calls “the most enchanting film of the time” (13). If the artefacts, icons and cultural productions of the Cultural Revolution are parodied and poked fun at in Heat, they are tinted with an elegiac nostalgia and subtle irony in Jia Zhangke’s Platform. 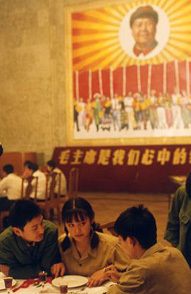 The film’s opening scene, set in 1979, shows a brightly lit stage in the foreground and the dark audience in the background, framed by slogans promoting the “Four Modernizations” of Deng Xiaoping. A woman in a blue uniform walks on stage with her back to us and announces the program to follow: “Train Heading for Shaoshan”. In the next shot, filmed from the last rows of the audience, we see the “train”, actors hooting and inching forward with their stools, enter the bright-lit stage. The actors are colourfully dressed and make lively, exaggerated gesticulations, but their faces are indistinguishable white spots on the screen. The director resists by all means the temptation of getting any closer. Like his influence Hou Hsiao-hsien, Jia Zhangke is, in Boym’s definition of the reflective nostalgic, “enamored of distance, not of the referent itself” (14). Even though “Train Heading for Shaoshan” is one of the many hosannas to Mao from the Cultural Revolution, we would find out in the next scene that, for the protagonists of the film, it’s more about the train than about the Chairman. The film is set in Jia Zhangke’s hometown, Fenyang, a county town in Shanxi Province, a place so marginal that the twenty-year-olds of the itinerant song-and-dance troupe had never even seen a train, much less ride in one. They could only imagine what a train looks and sounds like from watching movies, and in the darkness of a night bus, they form a chorus in imitation of a train’s wheels, engine, and whistle. “The train is especially significant for us who live in landlocked isolated places,” said Zhangke in an interview with Stephen Teo. “We can’t see the sea and we are ignorant about the outside world. […] The train stands for hope and the future.” (15) The train in the song “Train Heading for Shaoshan” had also once stood for hope and the future, but in 1979 that dream was already fraying at the edges, if not dissolved altogether. The film, however, is less concerned with those who ride on the train as those who are waiting at the platform. In fact, the first time that the main characters see a train, they run towards it, but the train had already passed by and they could only yell after it. If the train here can be read as the inexorable progress of history, then history does not so much happen onto the characters – the way it does in To Live and Farewell My Concubine – as it does pass them by and leave them behind. Throughout Platform, the marginality, rather than typicality, of the setting and the characters are emphasized through their dialect and their aspirations to catch up with the outside world, “the big cities”, by wearing bell-bottoms, listening to Deng Lijun’s love songs, and getting perms. When they leave Fenyang to go to even more remote places, however, they meet those who are even more marginalized than themselves. Cui Minliang (Hong Wei Wang), the film’s protagonist, once runs into his cousin Sanming (Han Sanming) who must risk his life to work in a coal mine. Sanming is younger than Minliang, but looks much, much older. On the way to the mine, Sanming turns down Minliang’s offer to ride in a tractor with the performing troupe and takes instead a small, steep footpath that branches off from the main road, a path that visually speaks of his peripheral situation. Once they reach the mine, a vulgar foreman tells Sanming to put his fingerprints on a contract, and since Sanming is illiterate, he asks Minliang to read it out loud for him. The gist of the contract is that the mine takes no responsibility for any accidents, and if the miner dies then “in the spirit of revolutionary humanitarianism” the mine would give his immediate relatives a one-time compensation of 500 yuan. After hearing the contents of the contract, Sanming signs his life over without any hesitation. The scene, executed with naturalism, highlights the great disparity between governmental euphemism and the brutal reality at the grassroots. Even Sanming, however, does not live without dream and longing. Following the signing of the contract, Minliang walks with him to the edge of a cliff and, after a few moments of silent communion, Sanming shows Minliang a picture from his pocket. There is no close-up of the picture, but we hear Minliang ask: “Is this your classmate? She’s pretty.” “I never went to school so how can I have any classmates?”, Sanming replies, takes the picture back and keeps smoking. As one of the most inarticulate characters in the film, Sanming’s longing is then conveyed through – or displaced into – Minliang’s performance in the next scene. The 1983 song, “My Chinese Heart” (“Wo de zhong guo xin”), expresses the imaginary nostalgia of an overseas Chinese who “wears a Western suit but has a Chinese heart”. In imitation of the song’s famous singing Zhang Mingmin, Minliang wears a long white scarf, a retro of the May Fourth students, and sings with a Cantonese accent. The irony here, of course, lies in the fact that neither Sanming nor Minliang has ever gone very far away from their birthplaces. Sanming would come down from the same mountain path to catch Minliang and ask him to deliver five yuan to his younger sister with the message that she should study hard and never return to their village, a message in direct contradiction to the homeland nostalgia in Zhang Mingmin’s song. In this section, I would like to devote some attention to the use of music in the four films under analysis. The music used in each film may be roughly divided into two overlapping categories: a theme song that repeats throughout the film, on the one hand, and “era music” specific to the historical time in the diegesis of the film. Apart from Farewell My Concubine, where the theme is the opera tune itself, the theme songs in the other three films are all nondiegetic, without lyrics, and original compositions. In To Live, the theme song, replete with folk motifs and performed with traditional instruments, seems to underline the “message” of the film: survival of the human spirit against all odds. The Peking Opera theme of Farewell My Concubine can also be translated as into a lesson, spelled out by the opera master: “Each person is responsible for his own fate.” While both of the Fifth Generation films use “Chinese music” as their theme songs, the directors of In the Heat of the Sun and Platform have opted for a score that cannot be recognized as “sinicized” in anyway, and as such they are more abstract, conveying less of a message than a mood. 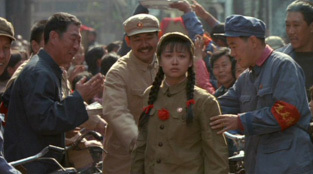 According to Jiang Wen, the pastoral score for In the Heat of the Sun, which serves as a leitmotif for the appearance of Xiaojun’s beloved girl Mi Lan (Jing Ning), has its origins in Pietro Mascagni’s opera, Cavalleria Rusticana, and “music remembered from the Cultural Revolution”. The theme music in Platform, on the other hand, is much more sad and desolate, contributing to the characters’ litost, “which means at once sympathy, grief, remorse and undefinable longing” (16). If the boundary between message and mood in the theme music can still be blurred, it is harder to ignore the different treatments of “era music” in these films. As mentioned earlier, each “era” in To Live begins with the most popular music of its time and serves as one item in the multimedia reification of an era. Though we also hear the somewhat out-of-tune version of “Sail the Great Sea Relies on the Helmsman” at the revolutionary wedding, there is no mockery or perversion of the song itself, and hence the meaning of the lyrics is never probed. In Farewell My Concubine, there is only one notable instances of era music. In 1949, when Dieyi and Xiaolou perform Farewell My Concubine for a theatre full of People’s Liberation Army soldiers, Dieyi stops short before the end is unable to finish. Xiaolou begins to apologize for fear that the PLA soldiers would also get angry like the Nationalist soldiers a few years ago, but the audience, who apparently have no idea that the opera is unfinished, give their enthusiastic applause and continue to sing a Communist military song, “Our Troop is Marching Forward”, which must strike Dieyi and Xiaolou as terribly crude and ignorant. In both To Live and Farewell My Concubine, every era, as expressed through its music, is a crystallized unit with uniform values. The music, entirely complementary to the plot, appears clean and unalloyed. However, the same kind of propaganda music becomes problematised in the other two films. Yomi Braester has analysed the way the heroism of “The Internationale” was trivialized through the senseless gang-fighting scene that it accompanies. In Platform, the song “We Workers Have Power”, blasting from an old loudspeaker, accompanies an early scene where Cui Minliang and Zhang Jun are trying on bell-bottom pants. Minliang’s father subsequently rebukes his son, asking him how he could do any physical labour in those “bourgeois pants”. The father’s sanctimonious ideological rectitude, reinforced in a later scene as he scolds Minliang’s brother for reading a comic of La Dame aux Camélias, is exposed as hypocritical towards the middle of the film, when Minliang’s mother finds out about his affair with another woman. In this paradoxical, transitional era where paeans to Chairman Mao co-existed with Teresa Teng’s syrupy love songs, the values of all the characters in the film undergo major changes, even – or especially – older authority figures such as Minliang’s father and Lao Xu, the pre-privatisation leader of the song-and-dance troupe. In the early 1980s, he still held Maoist-style meetings to criticize, say, the perversion of the song “We the New 80s Generation”. At this time, the performing troupe is still a vehicle of state propaganda, but soon the State is not going to take care of the artists anymore, and the paternalistic Lao Xu is about to be replaced by the entrepreneurial Lao Song, who would treat the artists like his personal property, to be sold at China’s new free market. Under his leadership, the Peasant Culture Group of Fenyang is reincarnated as the All-Star Rock n’ Breakdance Electronic Band. In the process of this transformation, the same songs would come to have altogether different meanings. In the film, we hear the song for the first time a good hour into the film, when the truckload of artists are stranded in a valley at dusk. Cui Minliang puts on the tape, and the song breaks into the silence of the mountains like a fresh breeze. At this point, someone hears a train whistle in the distance, so that they all begin to run towards the railroad and are just in time to yell after it. 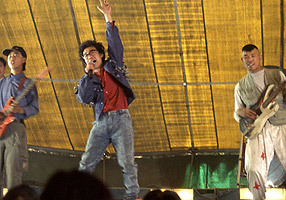 In this scene, the song is accompanied with euphoria, but the next time we hear the song “Platform,” it is Cui Minliang who performs it under a tent with blinking lights, wearing jeans and sunglasses. He hops up and down, shaking hands with members of the audience, a chaotic, rowdy crowd that keeps throwing things onto the stage. Bank bills? Rotten tomatoes? Actually, it is hard to tell if they are cheering or booing and Minliang has trouble, even with the help of a microphone, to keep his voice above the general din. 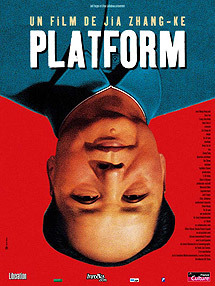 In some ways, the song “Platform” has a very similar status in this film as Fugui’s shadow puppet opera in To Live or, for that matter, the Peking Opera after which Farewell My Concubine is named. In all three instances, it is the song through which the film’s protagonists articulate their innermost feelings to a wider audience. Compared to the audiences in Platform, however, the audiences in To Live and Farewell seem much more captivated by and capable of identifying with the performances on stage. 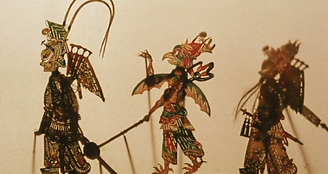 Whether it is in the middle of a battlefield or in the chaos of making steel, Fugui is able to set up his shadow puppet stage and win a large, enthralled audience. In Farewell My Concubine, too, Cheng Dieyi and Duan Xiaolou always sing to a full theatre. Surely, the Cultural Revolution put an abrupt end to all that: the shadow puppets are burned along with the beautiful old Peking Opera costumes, putting an end to the singing careers of their owners. The performing artists in Platform, however, have clung to their old professions, even if the songs they had to sing have in the meantime changed beyond recognition, even if their audience consists of lecherous old men who pose as censors, or even when they have no audience at all. Jiang and Jia do not seek to represent “China” or “The Cultural Revolution” or “The 1980s”. Jiang Wen claims that it would be a misunderstanding to call his film a “Cultural Revolution film”: “For people like me and Wang Shuo to write a story about a boy turning into a man, [the Cultural Revolution] is the only time period we know.” (18) The local, specific and personal qualities in their films, however, do not hamper their appeal to universal human emotions. While Jiang tries to a make a film about a young man’s coming of age, Jia grapples with the theme of home, homesickness, and the return to origins: “I feel that going home is only one process in human behaviour. In following the process of growing up and coming of age, human spirituality returns to the starting point.” (19) Both seek to make films in a more general humanist tradition and not so much in the “spectacular China” mode of Fifth Generation films. The films may not be strictly autobiographical in the sense that Ma Xiaojun is Jiang Wen as a boy or that Jia Zhangke used to be part of a song-and-dance troupe, yet many important details in the films could be traced to the directors’ personal recollections. “My films unfold from a small part of something”, Jia said, “an expression, perhaps, of a person, or a piece of music that allows me to return to a particular time or mood.” (24) Such “fragments and splinters of the past”, according to Boym, “cannot be completely mapped” (25), and, being true to these memories, Platform is full of gaps and ellipses, loose ends and free associations. The top criterion for the film’s narrative logic, sound and mise en scène is the director’s own memory and subjectivity, not dramatic effect, which makes the film at the same time less spectacular and more daring than its Fifth Generation predecessors. One example of this bold subjectivity may be found in the hospital scene where Zhong Ping (Tian Yi Yang) must undergo an abortion since her lover Chang Jun (Jin Dong Liang) is unready for marriage. After she slaps him and strides into the operation room, we hear the loud news broadcasting of the massive National Day military parade of 1984 and of Deng Xiaoping’s inspection of the troops. Perhaps Jian Zhangke had in mind the opening of Hou Hsiao-hsien’s city of sadness, where the Japanese emperor’s declaration of defeat on the radio accompanies the birth of a baby. In this case, the abrupt intrusion of this extra-diegetic official voice drowns out Zhong Ping’s cries, and the grandiose national jubilations, juxtaposed against the traumas of small people, takes on an oppressive tone. In the author/director/narrator’s memory, the sun had always shown in those adolescent days, and it was an eternal summer. Hence, even the interior shots of the film are often awash in the celestial, dreamy light of the sun streaming in through the windows. It is this light, which gives a brilliant aura to everything, that gave this film the power to awaken nostalgia even in those who had not lived through the Cultural Revolution. This adult voice-over, at once tantalizing and tongue-in-cheek, fluctuates between nostalgia and irony, between self-grandiosity and self-deprecation. Every time we find ourselves drawn into his story, he chuckles and tells us that it never happened, that he had made it all up, and then keeps going with the story anyway. In effect, he has deconstructed all representations of the past as subjective, showing that “the sense people have of themselves and their own moment of history may ultimately have nothing whatsoever to do with its reality.” (30) This does not mean, however, that memory is worthless just because it is unreliable. If this film carries any message, then it shows that fantasies of the self, or of one’s own era, have real impact on one’s actions. After all, without the heroic Maoist myths inculcated by films like Living Forever in the Blazing Fire and by songs like “The Internationale”, the violence of the Cultural Revolution would never have had found its moral justification. If the long shot and the panoramic shot serve to preserve that potential space, then the long take serves to preserve and contemplate on the passage of time. In the middle of the film, when the troupe is to give a performance in celebration of the arrival of electricity at a village, we hear a local official give a speech in the darkness to the gathering of villagers. He ends the speech with the slogan: “When drinking water, we should remember the one who dug the well; Let us always follow the Communist Party!” Those words, however, fall into silence and darkness, so that he has to repeat the slogan twice more before lights were finally turned on. That half-minute where nothing happens, however, makes the audience intensely aware of the agitated waiting in the dark by the crowd for the Party’s many promises. The abovementioned scene, found in the first quarter of the film, begins with Zhong Ping flipping through and singing out of a songbook, and then her Yin Ruijuan comes along and tells her about an execution she had just passed by. In both To Live and Farewell My Concubine, an important execution scene takes place after the Communist takeover, and the convicts both had intimate crossings of destiny with the protagonists, who must then witness or even support their death sentence. In both cases, the executions are portrayed as great spectacles that shake the protagonists to the core. Here in Platform, however, the execution receives no visual representation and enters the film’s narrative in a chitchat between two girlfriends. After sharing the gruesome rumour that some people are waiting to lick the brains of the dead, they go on knitting, smoking, painting their eyebrows and chatting about other people’s love affairs. Such apathy, however, is counterbalanced by their – and the director’s – reluctance to participate in the mass spectacle of state violence, and is in many ways more realistic than the dramatic brilliance of direct witness. It is because the formal apparatus of nostalgia films has trained us to consume the past in the form of glossy images that new and more complex “postnostalgia” statements and forms become possible. Both Jia Zhangke and Jiang Wen acknowledge their indebtedness to the “Fifth Generation”, who, through their spectacular re-mythification of history, had first “probed the philosophical foundations of the official narrative” (35). Yomi Braester notes the way In the Heat of the Sun alludes to the imagery of Red Sorghum and points out that both films “have changed the way key moments in China’s history have been recounted” (36). Even Jia Zhangke has openly cited the Fifth Generation as the reason he wanted to make movies in the first place: “I wanted to become a director after seeing Yellow Earth.” (37) And yet, Jiang Wen and Jia Zhangke have not merely followed in the footsteps of their first inspirations, but rather have created out of their own recollections scenes packed with iconoclastic parody and deadpan irony. While their films continued to circuit in international film festivals, the young directors are not so much in the enterprise of “exhibiting” a timeless spectacular China to an international audience as they aspire to a cinema with local features and individual accents, but a cinema that nevertheless has a universal, humanist appeal. Paul Virilio, War and Cinema: The Logistics of Perception, translated by Patrick Camiller (London: Verso, 1989), p. 39. Vera Dika, Recycled Culture in Contemporary Art and Film: the Uses of Nostalgia (New York: Cambridge University Press, 2003), p. 10. Dai Jinhua, “Imagined Nostalgia”, in Arif Dirlik and Xudong Zhang (Eds), Postmodernism & China (Durham: Duke University Press: 2000), p. 210. Geremie Barmé, In the Red: On Contemporary Chinese Culture (New York: Columbia University Press, 1999), p. 321. “Jia Zhangke: Pickpocket Director”, in Beijing Scene 5(23), 1999. Svetlana Boym, The Future of Nostalgia (New York: Basic Books, 2001), pp. 41, 49. Rey Chow, Primitive Passions: Visuality, Sexuality, Ethnography and Contemporary Chinese Cinema (New York: Columbia University Press, 1995), p. 145. Dai Jinhua, Wu Zhong Feng Jing: Zhongguo dian ying wen hua, 1978-1998 (Beijing: Beijing University Press, 2000), pp. 285-6. My emphasis; Boym, p. 53. Yomi Braester, Witness against History: Literature, Film, and Public Discourse in Twentieth-Century China (Stanford: Stanford University Press, 2003), p. 194. Frederic Jameson, “Nostalgia for the Present”, in Postmodernism or, The Cultural Logic of Late Capitalism (Durham: Duke University Press, 1991), pp. 287-8. Stephen Teo, “China With an Accent – Interview with Jia Zhangke, director of Platform”, Senses of Cinema vol. 15, 2001, p. 12. Richard James Havis, “Illusory Worlds: An Interview with Jia Zhangke” in Cineaste, Fall 2005, p. 58. Jiang Wen, Yi bu dian ying de dan sheng (Wuhan: Chang jiang wen yi chu ban she, 2005), p. 6. Teo, p. 5; Jiang p. 4. Quoted and translated in Braester, p. 193. Ban Wang, Illuminations from the Past: Trauma, Memory, and History in Modern China (Stanford: Stanford University Press, 2004), p. 93.